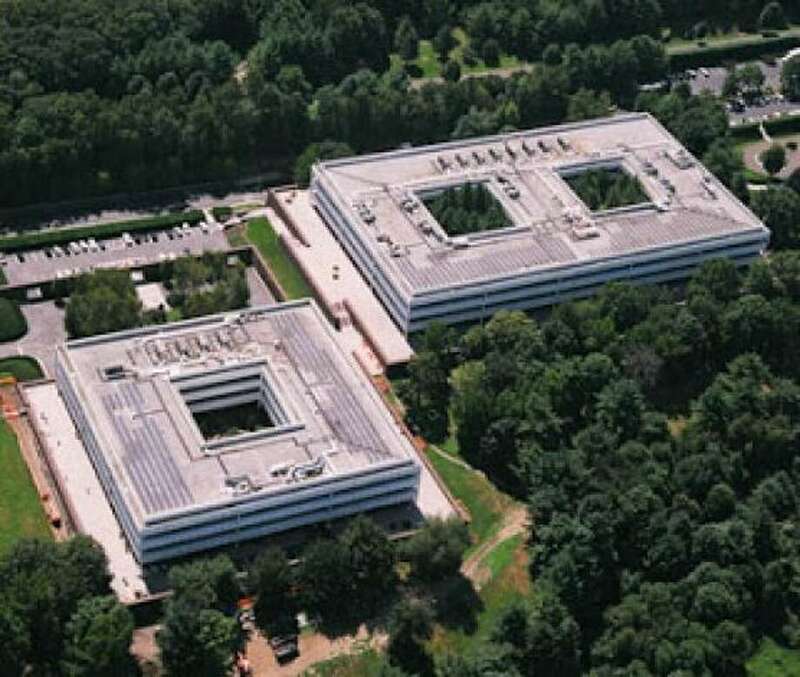 An aerial view of GE corporate headquarters on Easton Turnpike. The international conglomerate has said it is looking at options for relocating out of state. Fairfield’s Economic Development Director Mark Barnhart is blunt. “You don’t replace a GE,” he said last week after the international conglomerate took at least one public step following through on its threat to move its headquarters from Fairfield — and entirely out of state. That possibility was raised by GE officials after the General Assembly’s Democratic majority adopted a budget that raised the tax liability for corporations. GE opened its corporate headquarters in1974 on a nearly 7-acre campus on Easton Turnpike. The property, adjacent to the Merritt Parkway, includes two office buildings and a “guest house.” According to court papers filed in the company’s 2005 appeal of its local property tax assessment, housed in one of the office buildings are a medical center, a cafeteria, a fitness center, a production studio and an employee store. The guest house has 28 rooms, conference areas and dining facilities. The white-sided structures built into a hillside have become as much a local icon as the Penfield Reef lighthouse. But unlike the lighthouse, GE adds much to the town’s tax coffers. The largest taxpayer in town, GE accounts for roughly $1.8 million in tax revenue annually based on an assessment of $76.5 million. And many of its headquarters employees live in Fairfield, where they also pay property taxes and patronize local businesses. Days after legislative adoption of the budget — which still could be revised in a special session — GE CEO Jeffrey Immelt wrote in an email last week that he has assembled an "exploratory team" to review the company's options to move to a state with a "more pro-business environment." A GE spokesman said this week the company had no new statements to make regarding the issue. Tetreau said his objective is to keep that dialogue going and added, at this point, both sides indicate a solution is possible, though not guaranteed. The threatened move, Tetreau said, is caused mostly by state budget changes, not only to the unitary tax but treatment of tax credits. Both sides, he said, have agreed to tone down the rhetoric. But state Sen. Tony Hwang of Fairfield, who said Tetreau — like Malloy, a Democrat — needs to “engage the governor directly,” doesn’t think that is enough. Hwang also thinks the town’s Representative Town Meeting should take a vote of “no confidence” in Malloy, much like Trumbull’s Town Council is apparently poised to do. “While merely symbolic in nature, it would certainly send a powerful message if Fairfield and towns across our state did the same,” he said. As the state Senate began its debate on the budget proposal last week, Selectman Kevin Kiley, a Republican, initiated discussion of the issue at the end of the Board of Selectmen’s meeting. Kiley asked the Democrats on the board, Tetreau and Selectman Sheila Marmion, to add their signatures to a letter he drafted to Malloy asking that the budget be vetoed. Tetreau said while the suggestion of jointly signing the letter was discussed at the meeting, Kiley sent it to Malloy before it could be discussed again. In her freshman year in office, state Rep. Cristin McCarthy Vahey, D-133, broke ranks with fellow Democrats, casting a “no” vote on the budget. GE’s announcement about exploring relocation, she said, is not an idle threat and one that must be taken seriously. “One way this can be accomplished is by normalizing our budgeting process, which will help business with their longer term planning” Tymniak said. In addition to the property tax the town is paid by GE, it also receives some extras, like a recent $10,000 donation to enable the Police Department to test and purchase body cameras for officers. Other donations include 40 acres of open space at Lake Mohegan; training, rescue and fitness equipment to the Fire Department, and a multi-year commitment to help fund costs for a police dog. In addition, most of the furniture in Sullivan-Independence Hall is hand-me-downs from GE. But, local officials admit, GE also derives a benefit from being located in town. “I think what Fairfield provides to GE employees is what it provides to all of its residents and businesses — an exceptional educational system, a thriving arts and cultural scene, fantastic restaurants, two universities who partner with business and the town, world-class libraries, a beautiful locale, including lakes and beaches, proximity to Boston and New York, the train, and so many amazing people who are engaged, care for one another and care deeply about this town,” Vahey said. There’s also been debate about how much GE does or does not pay in state taxes, but state corporate tax returns are not public information.